I'm writing a serires of books like warriors but called Clans. The main character is Mosskit. She is a Russain blue cat with blue eyes (Kinder like Bluestar) she will become Mosscat (I put cat at the end of a apprentice's name) then Mosswhisker, then she becomes Moondust. 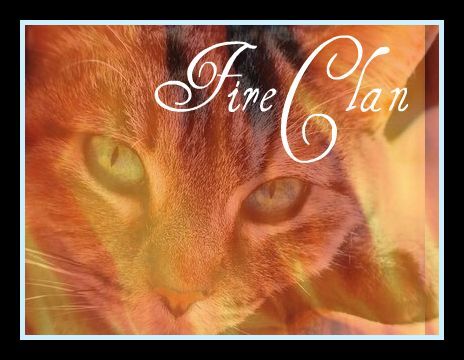 (Main story line, for all books) Mosswhisker is a warrior and when there is a battle between Treeclan and Creakclan at the end of the battle a 3 moon old kit falls into the creak. And Mosswhisker remebers the experirants of almost drowning when she was 3 moons and how Brackenleaf saves her from the waterfall further down. Mosswhisker jumps into the creak an grabs the kit by the scruff and puts her onto the shore. When she puts the kit onto the shore the hole of Creakclan i trying to come and save both her and the kit. But they get there to late Mosswhisker put the kit on the shore and was swept further down the Creak. Brackenleaf tries to save her but she is swept over the waterfall and plunges into the cold water of a lake. All the other cats think she died, but Brackenleaf and Mintpaw know she didn't and alaways wait for her. Brackenleaf tries to start a Journy to find Mosswhisker but Mintpaw stops him. Brackenleaf tells her that it was his job to protect her when she was a kit and if he doesn't go to save her that he would have failed his duties. Moondust falls into the lake and swimms back up she is repetily pushed under and about to drown when a hooman (twoleg) 12 year old jumps into the lake and saves her. Sounds like an awesome book, I can’t wait to read it!!!! Yes it does sound interesting, I will read it! Ok since you re all so interested I will tell you a bit more! When the hooman saves her she takes Mosswhisker home and renames her as Moondust. The hooman eventually shows Moondust the half kitty-pet Midnight (tom black cat with blue eyes) she lives with Midnight in the barn. (chapter by Midnight's point of view) Midnight walks into the bush and finds Moondusts and the cat fighting. Moondust has two kits from the cat. Moondust wrote: Ok since you re all so interested I will tell you a bit more! So moondust has a forced un-wanted mating? How about Halfwisker or Bionicle? as the stray mean kitty-pet? The kits names are Stormkit and Ivykit, storm kit is a dark blue kit and Ivykit is a blue and grey tabby cat. Midnight pretends to be the dad, but the cat steals Ivykit, Eventully Midnight fights him and becomes top cat in the area. Moondust has four kits with midnight called Loyallit, ravenkit, silverkit, and Snowkit. Midnight and Moondust train them, and then they are given there warrior names as: Loyalheart, Ravensnow, Silverstream, and Snowdust. Then the hooman and the family all move to Roleystone. And Moondust recognises the area as her home. Moondust eventually goes down to the creak and meets Brackenleaf and Mintpaw up the stream. All three go down to the creak and Moondust is hardly recognised. Swiftpelt her first mate sees her and calls "Mosswhisker?" then everyone knows who she is. I like both names! Thanks Puss in boots I will do tally and use the with the most Tallies and inform you rich it shall be! Thanks again Puss in boots! First everyone is a little edgy and some of the cats hiss at her but eventually they all greet her back at the clan. Then she meets Leaftree; Swiftpelt's new mate, at first she is angry but then she understands for she took the new mate Midnight. Brackenleaf and Mintpaw are welcomed back gladly. Brackenleaf returns to his duties as a nursery guard but always guards Moondust and Mintpaw. Midnight tries to join the clan but most cats don't greet him warmly. Midnight must prove himself at the the comps each moon. Loyalheart, Ravensnow, Silverstream and Snowdust are all welcomed and also prove them selves in the comps. Creakclan takes them in. And they become amazing warriors. Still more to wright but taking a brake. Can Minnowflash be in your book? And can I be the first to read the books? What are you going to call them? Are you going to call them warriors? Well for cats out of apprenticeship they will be called warriors. Shnowfall, Jaywing, Dropstar, Starheart, Fullmooon, Shadepelt, Silverheart, Shardrop, Shimmerpaw, and Waterstar, one more Lillypad. They will be scattered through the different clans. More cat names are welcome, please suggest warrior names and I will chage them according to the positions. And if you like you can tell me what clan they will be in. and Creakclan the Loyal ones. This is for your story right? Yes it is I'm still writing it. Just an idea but why don't I make a topic just for peoples' stories? then you can post your whole story there for people to read if you want or you can just put a 'teaser' up. Your book sounds very interesting and I look forward to reading it!!!! I can't wait.